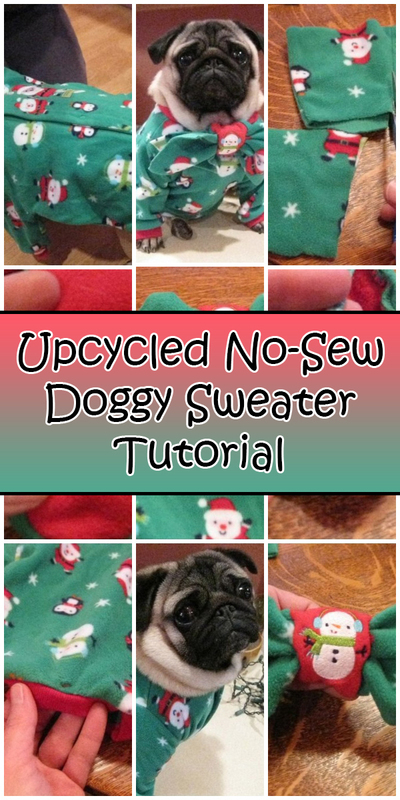 For all you pet lovers who want a cozy dog sweater without the expense, try this nearly-free version that requires no sewing. 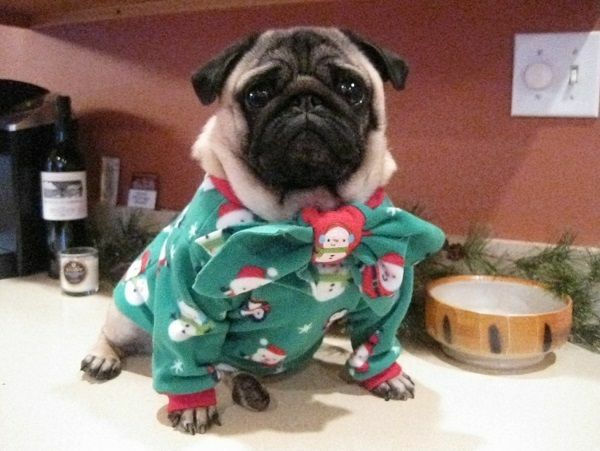 We went with a Christmas theme, but you can use any sort of design or pattern that your heart desires. 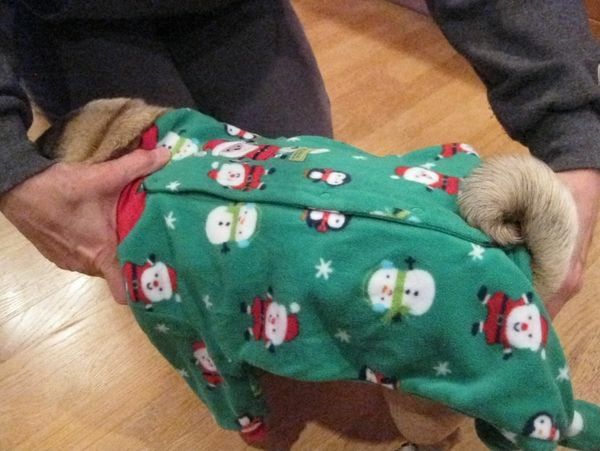 Visit your local thrift store and select a fleece infant sized sleeper that is the approximate size of your pet. 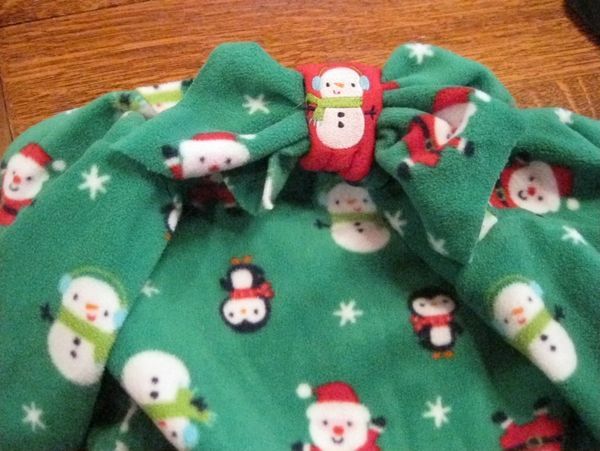 It is important to choose fleece because it can be cut without the need to sew it to prevent fraying. I measured from neck to tail along the back of my dog. Cut the sleeper in half, roughly where the waist would be on a child, or to the point which is as long as you want the finished sweater to be. 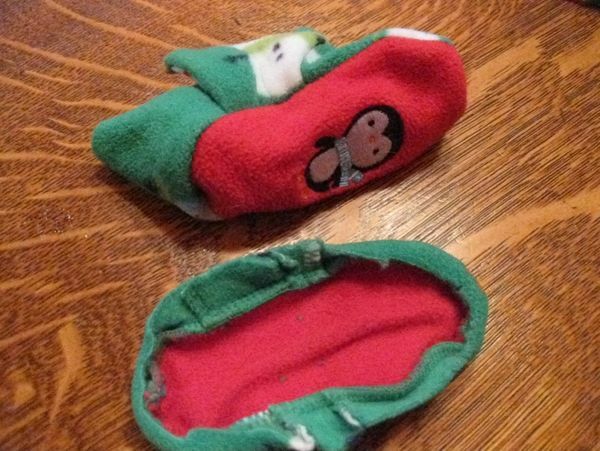 Cut off the footie part and save them for later. Cut two sections from the leg pieces and lay those out flat. This will be part of the bow. 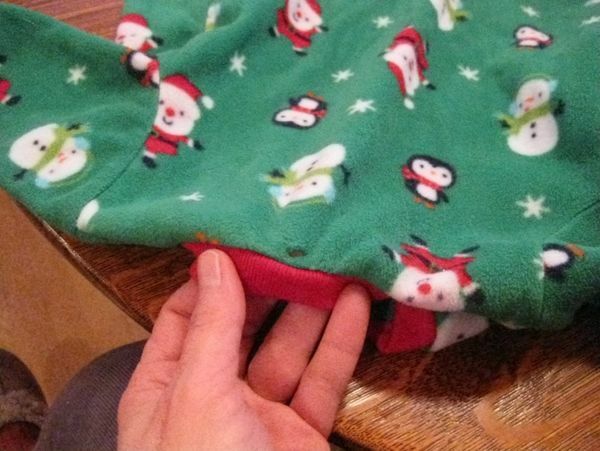 Cut away the snaps and seam. 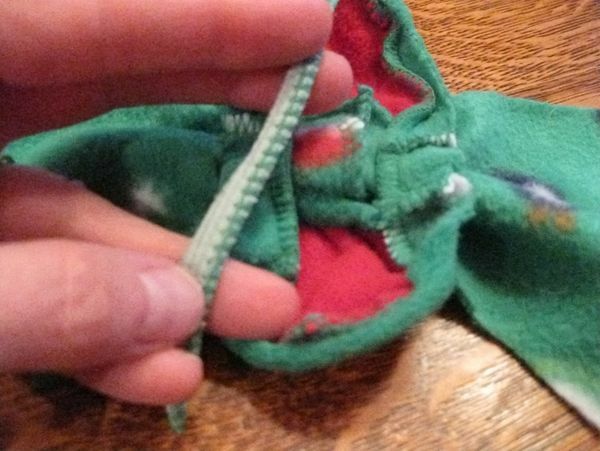 Trim around one of the foot sections close to the seam, but leave the seam itself. That edge will naturally turn in with the seam in place and leave an edge that appears finished when looked at from the front. 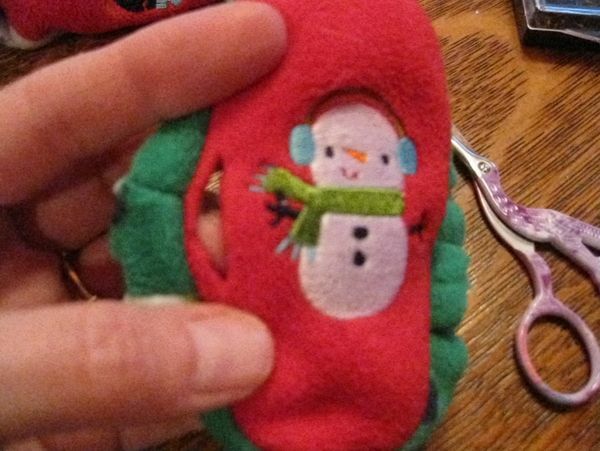 Cut tiny slits on either side of the front of the foot section. Overlap the two leg sections you saved earlier and thread them through the two slits you cut in the foot section. Arrange them to form the bow. Turn the foot section over and cut two more small slits on the top and bottom. 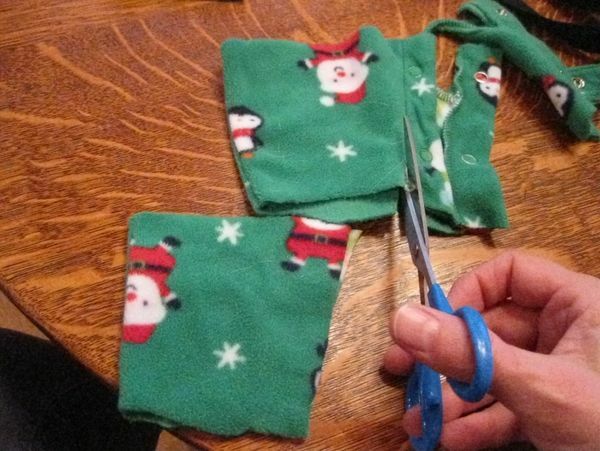 Trim a short section of seaming material away from one of your scraps. Thread that through the last two slits and get ready to tie that to the neck edge of the sweater. Cut a small slit into the appropriate place on the neck edge and tie on the bow. 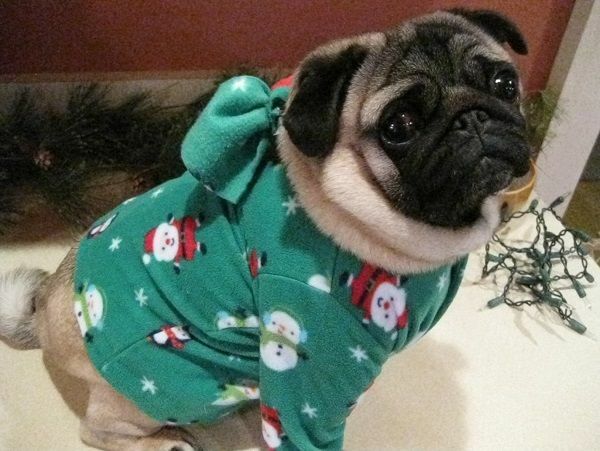 Your pup can wear with the bow in the front or back. 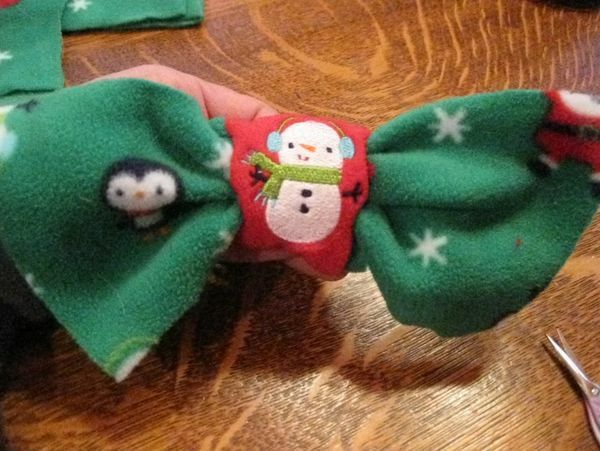 If I had a little girl I would make a second bow for her hair out of the other foot section!